When you aren't feeling all too great on a long weekend and can't really take advantage of all the time to do active things, what do you turn to? Well, that's what happened to me this weekend, and I always turn to some enjoyable comfort reads. So I have two books by a favourite author, Simone St James, to share with you. I've read all of her work now, and always anticipate more. You can see my earlier thoughts on The Haunting of Maddy Clare, or An Inquiry into Love and Death (still my favourite) or Silence for the Dead. Or you can see what I thought of these two romantic, gothic, supernaturalish reads! This one is a bit different from her other work: while there is a paranormal aspect, instead of a haunting we have a couple of spiritualists who can talk to the dead. It's set, as usual, in the 20s. 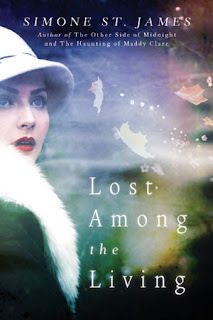 This is London between the wars, when belief in spiritualism and the longing to reconnect with the many lost lives is strong. Ellie Winter gave up her practice as a spiritualist alongside her mother after an incident; however, her former rival Gloria Sutter has just been murdered at a seance and had left instructions for Ellie to find her. So Ellie is drawn back into the thick of things, with Gloria's brother pushing her from one side and paranormal investigator James Hawley pushing from the other. The mystery turns out to be just as much connected to the political everyday as it is supernatural. But Ellie both finds her feet as the gifted psychic she is, and finds a solid romance too, through this exercise. St James writes a thoroughly believable London, with description of places and feelings and social norms strongly drawn. I just wanted Ellie to succeed and be happy, and so was very satisfied with the conclusion of this novel. Once again, entertaining and page-turning reading. 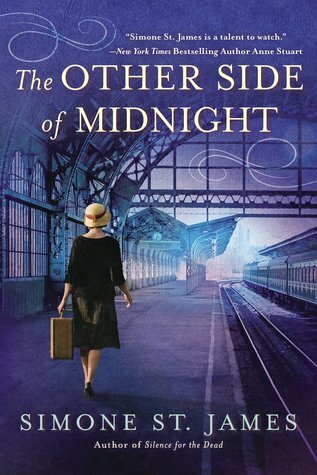 It's 1921, and Jo Manders, having lost her husband Alex as MIA in WWI, needs to find a living. She ends up as a paid companion to Alex's Aunt Dottie. And Dottie's life is no bed of roses. When they arrive at her country home, Jo finds that there are mysteries, both real and paranormal, to contend with. Not to mention that Dottie's husband and son are both problematic - rude, withdrawn, disagreeable. With a sense of ghosts lurking, and paranormal experiences that Jo seems to accept naturally, this is a creepy tale indeed. Alex's cousin Georgina, always considered slightly off, committed suicide at a young age, and she haunts the premises (quite literally). The mystery element and the romance element are both strong, and slightly reminiscent of DuMaurier's Rebecca. That said, Jo is not my favourite heroine so far, and so I found that I didn't engage as deeply in her story. I found there to be quite a few coincidences & strange choices on her behalf, so didn't love this story as much as the other St. James I've read. Of course, that still means that this was a very good read, and a perfect choice for comfort reading nonetheless! The mystery is indeed very mysterious, and only reveals itself slowly, keeping the reader guessing. And the atmosphere is perfectly 20's, English, ghost story. Well worth checking out. I loved both of these books...but then anything by Simone St. James is worth reading in my opinion. Her newest book was supposed to be released this April, but it's disappeared off of Amazon's pre-order list and has apparently been pushed back until 2018, which makes me sad. I was sooo looking forward to reading it this year! I was wondering what had happened to it! Darn, I was waiting for it too. I do love her books. I'm glad to be reminded of these, because I enjoyed An Inquiry into Love and Death myself. Might have to add a reread of that one (my fave) to this weekend's rota as I'm still feeling icky - this is a long-lasting cold! Hope you're feeling better - nice to have a bunch of books at home looking for attention in such a situation!